Last day in San Fran. We had a great nights sleep. Maureen snored like angel! Yesterday was full day seeing lots place ie. Alcatraz , 39 pier, which is Fisherman's Wharf, took lots of photos the one I have put on off exploring is at Ocean beach. 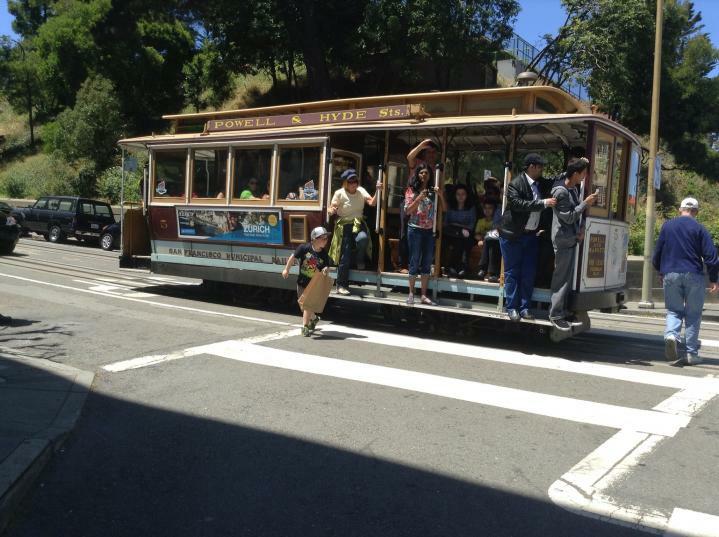 Today was to be a relaxing day but we want to see all we can while we are here in San Francisco, so it's trolley Bus tour ...also Tram museum ....with some of our group. Which are very nice. Debra thanks for sorting my little problem out. Susan can we take about your holiday when we get home. Just got back from our bus and tram day, it has been sunny and hot, the weather is changing tomorrow so it's the right time to move on. Route through Califonia Central Valley . On arrival in Merced we transfer by coach to# Yosemite National Park.